BBC One’s political debate programme Question Time is to begin its new series with a Labour Leadership Hustings Special in Oldham. The live programme will see David Dimbleby chair the debate between Jeremy Corbyn and Owen Smith on Thursday 8 September at 9pm on BBC One. Dimbleby's current deal with the BBC was due to expire this summer but he will stay with the BBC's flagship debate show after signing a new contract. He said: “It’s good news that the two contenders for the Labour leadership have agreed to appear in front of a Question Time audience. 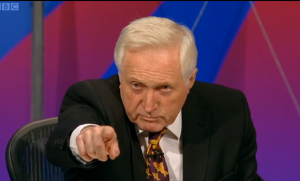 Dimbleby told The Guardian in June that he has "never really taken much notice of contracts".